Blackhawk! 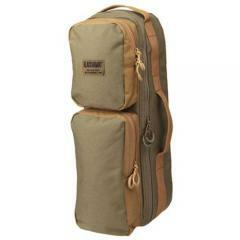 offers great options for storage and keeping tactical operatives or adventurers on the move. The Brick Go Bag is versatile enough to accommodate a range of duty gear or recreational tools and equipment. The padded strap and sling-style design create comfortable and convenient rotation on the shoulder and allow for rapid and effortless retrieval of supplies without having to remove the bag from the carry position. The exterior includes two pockets with elastic loops to secure smaller items. The main compartment features removable dividers that can be adjusted to maximize protection of fragile gear.